In the fall of 1980, Governor Bruce Babbitt was hiking with friends along Oak Creek southwest of Sedona. When they reached a certain property, an individual approached the group, advised them they were on private property and requested them to leave. This caused Governor Babbitt to become concerned about Oak Creek and many other hiking areas along waterways that were being closed to public access. The property where the group was stopped had been part of the Smoke Trail Ranch located along lower Oak Creek southwest of Sedona. 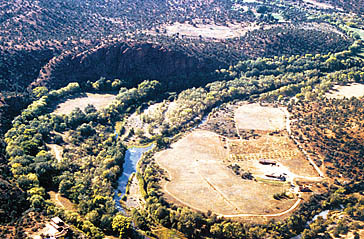 Helen and Jack Frye had purchased the Ranch in 1941. Jack Frye was the president of Trans World Airlines and he and his wife used the site as a retreat from the East Coast where they lived. The property has a variety of panoramic views of the Sedona red rock formations. The land is divided by a meandering 1.4 miles of Oak Creek that is lined with lush green riparian habitat. In the early 1970’s, a developer purchased the remaining 330+ acres of the Smoke Trail Ranch from Helen Frye. The developer intended to build a resort complex, but a shortage of funds caused them to lose the property. In 1976 Eckankar, a religious group that Helen Frye was a member of, became owner of the property. Eckankar (described as an “alternative religion”) was developing the property as a religious retreat for their members. Thus, it was Eckankar who had evicted Governor Babbitt’s hiking group from the property. After researching ownership of the property and recognizing its recreation potential, the Governor came to State Parks to discuss the possibilities of creating a new state park. The Governor offered to work with Eckankar, Anamax Mining Company, and the State Land Department to see if they could negotiate a land exchange that would place this property in State ownership. However, he needed the support of the State Parks Board to get the necessary legislation passed to allow the exchange of land across county boundaries and to know that the Parks Board would accept this property as a State park. At the time the State Land Department could exchange lands within a county but could not exchange across county lines without specific legislation authorizing such an exchange. The terms of the negotiation were for a three-way exchange where Anamax Mining Company would purchase the 286 acres along lower Oak Creek in Yavapai County from Eckankar. Anamax would then exchange this property with the State Land Department for State land Anamax had been leasing for use at the Twin Buttes Mine in Pima County. Negotiations with Eckankar were initiated. However, nothing could be finalized until the Legislature passed a bill authorizing the exchange of State Trust lands across county boundaries. State Parks worked closely with the Governor in support of the required legislation during the 1981 session. The bill that provided for the land exchange had been introduced in the Senate but had not passed in the required time frame. So the House selected Senate Bill 1184 and did a “strike everything” amendment, which included the necessary language for the land exchange across county lines. This bill passed the Legislature and Governor Babbitt signed it into law as Chapter 274 of the 1981 Legislature on April 27, 1981. 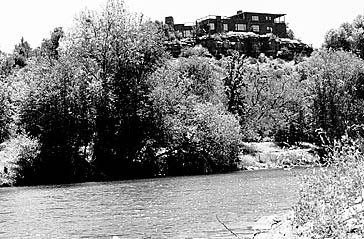 This legislation required that the Oak Creek land received by the State Land Department in the exchange be considered for use as a State park. The legislation also stipulated that State Parks had to prepare a proposal and a plan to address the use of the lower Oak Creek site as a State Park. The master plan and report had to include all aspects of establishing a park, i.e., funding, management, operations, and any further legislation necessary to implement the proposal and had to be completed by the end of December 1981. To expedite the master planning process a 12-member Ad Hoc Advisory Committee was appointed. Members of the Committee were: Robert Lopez, Cup of Gold Estates; Robert Gillies, Sedona Ranger District, US Forest Service; Kerry Baldwin, President, Arizona Association for Learning in and about the Environment; Dr. Eugene MacFarlane, Keep Sedona Beautiful; Gene Palmer, Sedona-Oak Creek Chamber of Commerce; Howard Craig, Sedona Red Rock Taxpayers Association; Edgar Lindfors, Homeowner, Red Rock Loop Road; Sam Fitzpatrick, Coconino Taxpayers Association; Wallace Leininger, Cup of Gold Estates; Ed Rabovits, Headmaster, Verde Valley School; Jean Strong, Eckankar; and Dave Maggard, Director, Yavapai County Planning and Zoning Department. The Committee provided communications and served as liaison between State Parks, the private sector and the business community. The Committee toured the site, visited Dead Horse Ranch State Park to become familiar with the behind the scenes operation of a state park and reviewed and made recommendations on the proposed Lower Oak Creek State Park Master Plan. At its October 1, 1981, meeting, the Committee reviewed and approved the proposed Master Plan. This Master Plan was then presented on October 16, 1981, to the Parks Board for its consideration. Following a staff presentation and in-depth discussion, the Board gave conceptual approval of the Park Master Plan. A presentation of the Master Plan was given to the Yavapai County Board of Supervisors on November 2, 1981, to fulfill the legislative requirement. A lengthy discussion pertaining to improving and paving the Red Rock Loop Road occurred following the presentation. At one point, a member of the Ad Hoc Advisory Committee told the Board of Supervisors that the Committee did not want anything to jeopardize this proposed State Park. The remainder of the discussion was much more congenial. The Board of Supervisors sent a letter to the President of the Senate supporting the plan for the Park. Charles Eatherly, Chief of Planning, Tim Brand, Park Planner, and Paul Malmberg, Regional Manager gave a public presentation of the proposed Lower Oak Creek State Park Master Plan at the Sedona Elks Lodge on the night of November 19, 1981. The Park Master Plan proposed day-use areas for picnicking and recreation areas. Existing structures were to be used where possible. One was to serve as a visitor center with views of Oak Creek and the Red Rocks and another for an environmental education center. Interior roads and parking areas were to be paved. Numerous hiking trails were planned with emphasis on interpretation of the natural and historical features. Limited overnight camping was planned for groups participating in the environmental education programs. Over 125 individuals attended the public presentation in Sedona and following the presentation expressed support of the Park Master Plan. At the December 4, 1981, Parks Board meeting, the Board reviewed and approved the final Master Plan and the Report for a Potential State Park on Lower Oak Creek. Copies of the Report and Plan were printed and submitted to the Governor, President of the Senate, Speaker of the House, and the State Land Commissioner prior to the December 31, 1981, deadline. Representatives of Eckankar, Anamax Mining Company, and the State Land Department had been in discussion concerning the proposed acquisition and land exchange prior to the necessary legislation being passed to allow for the exchange. When Senate Bill 1184 passed and was signed by Governor Babbitt in April 1981, all parties were ready to expedite the acquisition and subsequent exchange. 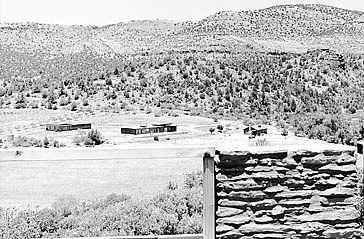 Once the appraisals and land surveys were completed, Anamax Mining Company purchased the 286-acre parcel of land that was the major remaining portion of the Smoke Trail Ranch on July 22, 1981, for $5,148,000. The application to exchange had already been filed with the State Land Department by Anamax Mining Company and the State Land Department had completed the majority of legal requirements to process the land exchange. With the acquisition cost established for the Sedona lands to be exchanged, the acreage of State land of equal value in Pima County could be determined and the exchange advertised for public review. This land exchange was completed in the fall of 1981 when Anamax Mining Company received title to the 3,947 acres of State Land in Pima County. Following the acquisition of the 286-acre parcel by the State Land Department, the State Parks Board was granted a Special Land Use Permit for the protection and security of the property. Park Managers Mike Sipes, Jon Clow, and Duane Hinshaw provided administrative responsibility for this site until John Schreiber was selected as the permanent manager. During the early years, the public was not allowed on the site; however, numerous groups utilized the site and facilities for special meetings. The groups included: the Department of Administration Budget Office, Governor’s Commission on the Environment, Arizona Game and Fish Project Wild Workshop, Natural Areas Advisory Committee, State Land Department, Inter-Tribal Council, Arizona Chapter of the American Planning Association, and State Parks for seminars, workshops and park manager meetings. The Parks Board submitted budget requests to the Legislature each year in an attempt to secure funding to develop the property as a park, but with no success. During the legislative sessions of 1982 and 1983, State Parks incurred a reduction of 15 positions and over $500,000 in operating budget reductions. So, the initial appropriation recommended for the Lower Oak Creek site was not addressed for several years. On the weekend of September 30, 1983, six members of the Arizona Chapter of the American Planning Association (APA) donated their time to reevaluate and explore other development potentials for the Lower Oak Creek site. The APA members who volunteered their time were Betty Drake, John Sather, Dave Zlotshewer, Bruce Lindquist, Jack Bestall, and John Tandy. The Lower Oak Creek Charrette was the first APA volunteer project of its kind in Arizona. The effort represented a cooperative spirit on the parts of the design team, the State Land Department, the Governor’s Office and the State Parks Board. Some of their early conceptual plans for the park included an outdoor classroom center with dormitories for overnight stays and a restaurant and cabins on the hill south of the Creek. On Saturday evening the team presented their concept plan to Governor Babbitt, guests and staff. This plan was similar to the first master plan with the major exceptions being the proposed integration of facilities and programs that could generate revenue to help pay the annual State Land lease fee. The team, working with local citizens and staff members of several agencies, prepared an alternate planning document for consideration by the State Land Department and State Parks Board. This planning effort resulted in the Arizona Chapter receiving a National Award at APA’s Annual Meeting in 1984. The State Parks Board had long been concerned about the State Land lease payments that would have to be paid for the Lower Oak Creek site after it was developed and opened to the public. In 1985, an opportunity was presented to the Parks Board where they could possibly get a Recreation and Public Purposes Patent on the 286-acre parcel. This would be accomplished through a complicated land exchange between the State Land Department and the Federal Government. The Parks Board had to relinquish a portion of its Federal lease on lands within Lake Havasu State Park. This land included all of Pittsburg Point (a concession area within the Park) and a portion of the adjacent shoreline. These lands were the most valuable properties that the Federal Government had with the State of Arizona. The Federal lands would be used to repay the State Land Department for State lands the Federal Government had taken for the construction of the Central Arizona Project. As an incentive for the Parks Board to relinquish its leasehold interest in the land at Lake Havasu, the State Land Department and the Bureau of Land Management (BLM) agreed to include the 286-acre Lower Oak Creek site. The Lower Oak Creek site would become property of the Federal Government. A Memorandum of Agreement regarding the disposal of Federal Lands at Lake Havasu City was signed by the BLM, State Land, State Parks and Lake Havasu City in November 1985. However, as this complex exchange was progressing in June 1986 the National Wildlife Federation filed a lawsuit that resulted in a preliminary injunction against the BLM’s Land Withdrawal Program. This action temporarily precluded BLM’s involvement in the land exchange. This lawsuit had to be resolved before the exchange could continue. Finally, the land exchange was completed and State Parks acquired the 286-acre parcel from the Federal Government through a Recreation and Public Purposes Patent on November 7, 1986. Following acquisition of the Lower Oak Creek site, the Parks Board officially named the site Red Rock State Park. In early printed materials, one can find this Park referred to as Lower Oak Creek State Park or Smoke Trail Ranch State Park. Operating and development funds were appropriated and the Arizona Department of Transportation initiated design of the park entrance road (along the alignment of the Lower Red Rock Loop Road) in 1987. State Parks contracted with a private consultant to design and construct the park visitor center. The dedication and opening of Red Rock State Park took place on October 19, 1991. Executive Director Ken Travous welcomed guests and introduced the Master of Ceremonies, Billie Axline Gentry, member of the Parks Board. Mrs. Gentry introduced Representative John Wettaw of Flagstaff, and thanked him for his assistance in getting the necessary legislation and appropriations for the Park. Representative Wettaw explained the history of the Park development. Then, Mrs. Gentry introduced Duane Miller, a Parks Board member for 25 years, his wife Beverly and their family. The Miller Visitor Center was named in their honor of for their years of service to Arizona State Parks.